The Church began observing the Year of Consecrated Life in late November at the beginning of Advent. It will conclude on the Feast of the Presentation of the Lord on Feb. 2, 2016, which also annually marks the Church’s World Day for Consecrated Life. As someone who entered the Congregation of the Most Holy Redeemer (the Redemptorists) in 1966, professed perpetual vows in the order in 1976 and was ordained a priest for the order in 1978, Archbishop Joseph W. Tobin is in a good position to reflect on the importance of the life and ministry of men and women religious in the life of the Church. He served as the superior general of the Redemptorists from 1997-2009 and, during that time, visited more than 70 countries around the world in which members of the order minister. In 2010, Pope Benedict XVI appointed him as secretary of the Vatican’s Congregation for Institutes of Consecrated Life and Societies of Apostolic Life. Soon thereafter, he was ordained a bishop. In this ministry, Archbishop Tobin served as second in leadership of the Vatican office which helps guide the life and ministry of the more than 1 million men and women religious around the world. Since being installed as archbishop of Indianapolis on Dec. 3, 2012, Archbishop Tobin has been appointed as a member of the same Vatican congregation for which he served as secretary. In this position, he and other archbishops and cardinals from around the world give the congregation’s leaders and Pope Francis guidance about religious life in the Church. 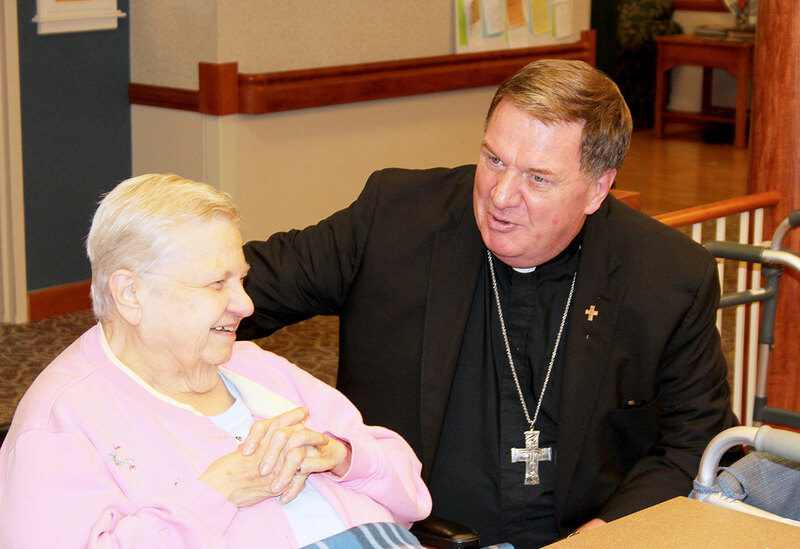 Archbishop Tobin recently spoke about the Year of Consecrated Life with The Criterion, reflecting on religious life both in central and southern Indiana and around the world. Q. How can the Year of Consecrated Life be an opportunity for the faithful in central and southern Indiana to reacquaint themselves with the importance of this vocation in the life of the Church and in their lives? A. “The first purpose of the year is to give thanks for the gift of consecrated life. Pope Benedict said on a number of occasions that a Church that does not have members of the consecrated life that are visible and present within it is impoverished. “Vatican II was the first ecumenical council ever to pronounce a theology of consecrated life. Religious were mentioned by about the third council at Chalcedon. But they were disciplinary canons. It was about how religious should behave and what monks should do and not do. “We rightfully have given great importance to what Vatican II said about the vocation of all the baptized and the vocation and mission of lay people in the Church. But, for consecrated people, a whole theological foundation was laid by the council. Q. What would you say from your own knowledge of it are a highlight or two of that teaching from the council that would be relevant for the faithful 50 years on? A. “ ‘Lumen Gentium,’ the Dogmatic Constitution on the Church, points out that while consecrated life does not belong to the hierarchical order of the Church, it does belong to its vocation to holiness and its charismatic life. That sort of insight was even sharpened by subsequent pontiffs. “You can say that John Paul II and Benedict made an argument that it is almost an essential element in the Church in so far, as Benedict put it, that it’s the life that Jesus chose for himself. He lived poor, chaste and obediently. And that’s what consecrated people, in one form or another, try to do. “The gauntlet that was thrown down by ‘Perfectae Caritatis’ [Vatican II’s “Decree on the Adaptation and Renewal of Religious Life”] was to return to the inspiration of one’s founder or foundress, which was incredible. “I can say personally for me it has had incredible results. I began in minor seminary a couple of years after the council closed. We were familiar with St. Alphonsus’ devotional materials like The Way of the Cross, the different novenas that he wrote, even some of his hymns. “We knew nothing of his [theology of missionary work]. We knew nothing of why he made the choices that he made. And I think that it was only because of the research that was sort of mandated by the council that this is now available for Redemptorist seminarians—as well as his devotional material. Q. The religious communities based in central and southern Indiana have a fairly wide variety of ministries and charisms. How can the faithful of the archdiocese be proud of that diversity? A. “In a certain sense, it reflects one of the metaphors that John Paul II used and Benedict, in one form or another, repeated. “They talked about the consecrated life as a sort of tropical forest where you’ve got different species of trees and plants. Some are old and weakened by their age. Some are thriving and strong. Some are new. But it’s an ecosystem, and so they’re not independent plants. They’re related to each other. “And I like to push the metaphor a little further and think of something like the Amazon Forest. It produces oxygen so that the world can breathe. Hopefully, that’s what consecrated life does in the local Church of central and southern Indiana. It produces a sort of spiritual oxygen through its witness. “What has struck me in the last two years is the respect and knowledge that people have of consecrated life. I would begin with the archdiocesan clergy and the fact that the majority of them are formed at Saint Meinrad [Seminary and School of Theology in St. Meinrad]. My perception is that they had a very positive experience of a religious community during their formative years. “The fact that many parishes return to Saint Meinrad or to [the Benedict Inn Retreat and Conference Center in] Beech Grove for retreats and prayer days, the fact that you really couldn’t write the history of the Church here without the Sisters of Providence or the Oldenburg Franciscans or the Benedictines from Saint Meinrad or Ferdinand [is significant]. Q. How can Catholics in central and southern Indiana understand and take to prayer the fact that some religious communities have had its membership shrink over the past generation? A. “There is no doubt [about the shrinkage], especially in the countries that we’re most familiar with in North America and Europe. That isn’t the case in Africa and many parts of Latin America and in Asia. “I’ve often heard a critique of the vocations in the [global] south, that they’re coming about, consciously or unconsciously, for economic reasons. Religious life is a way out of poverty. I used to hear an interesting contradiction of that from Father Peter Hans Kovenbach, who used to be the superior general of the Jesuits. “What he attributed the real growth of religious life in the south to is that they’re coming from well-heated local Churches, where the ecclesial life is really characterized by enthusiasm. “These local Churches produce all sorts of vocations—to the diocesan priesthood, to married life, committed lay people and to consecrated life. “I think that part of the worry and why we should pray is what we should conclude about a Church that no longer produces vocations to consecrated life. There is an ideology that it’s the religious’ fault, that they’re not true to their mission or are not wearing their habits. ‘While I wouldn’t absolve [religious] from all responsibility, I would say that it’s bigger than that. Maybe we’re producing a Church where the prime matter for religious life is decreasing—and that’s children. If a family has two children, how encouraging will parents be to a young person who wants to [explore religious life]? “We need to pray. And we pray and trust, because the charisms are gifts to the Church. They’re not simply human decisions. “We want to give thanks [for consecrated life]. We want to pray that our archdiocese always has the presence of religious life, and that young people today will consider whether God is calling them.